Ubuntu – Anything but "Hacking"
Note: If you prefer to use terminal, you may need root access to use the following commands. If necessary, append “sudo” to all commands. First, login to your remote server using ssh/ftp whatever. In your servers, say git repos are stored in /srv/gitosis/repositories directory (this is the default directory if you used gitosis). Say, we’re interested in a repo called “myrepo.git” – it’d be available in /srv/gitosis/repositories/myrepo.git location. Open file “description” and type whatever you want – text in this file will be sent in email’s subject as PROJECT NAME. showrev = "git show -C %s; echo"
emailprefix = "[My Git Repo] "
Save the file. If you’re using terminal, you can open the files for editing using nano <filaname> command. When done editing, press Ctrl + x for exit, then press y for saving, press enter to use original file name for saving the file. Open the file (“post-receive”) for editing. Uncomment the last line by removing the beginning “#”, then save it. Following 2 files should be made executable. I’m showing examples by terminal. If you’re using Filezilla/other file browser, make files “executable”, probably by right clicking on the files and clicking something like permission. That’s it! Now whenever someone pushes to the repo, emails will be sent according to the config file you’ve just edited. Note: If the file “/usr/share/doc/git-core/contrib/hooks/post-receive-email” is missing, you can use following file downloading. Assuming, you’ve Apache server installed already. Instead of <ip-of-your-machine> you can also use your computer’s name. Wondering what it means? Please visit this link, all of the fields (columns – you can see there are 6 columns in the line above sperated by spaces) are nicely explained. You will need one line like this for each of the partitions you need to automatically mount/execute etc. Save the file & restart your machine to see effects. To see various options available, study materials at following links. Open Users & Groups > Manage Groups. Double-click on FTP. Put tick-mark on your user-account, and click OK. 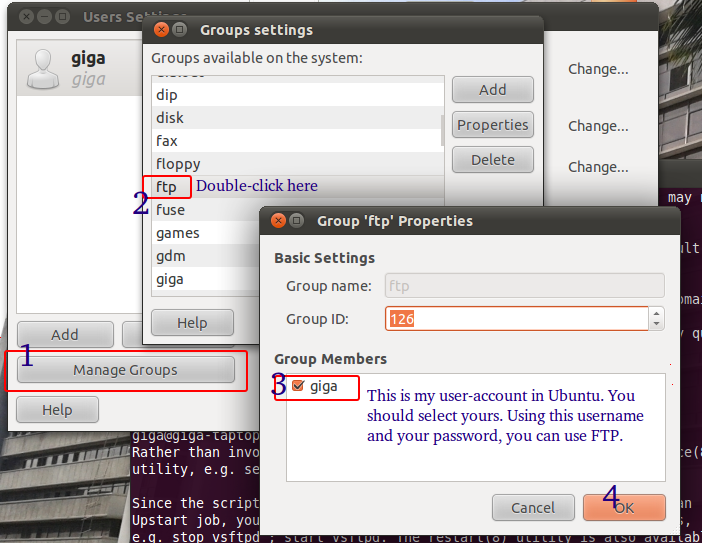 In the screenshot above, I’ve added my user account “giga” to the FTP group. So, I can use my username “giga” and my account’s password to run FTP. Run following command to own all of your Drupal scripts. Yes, we’re done. 🙂 Use your username (“giga” in this example) and system password to connect to FTP while upgrading modules. This is a bug. To force auto hide again, just drag (move) some icon in your desktop! Thanks to okey666 at ubuntuforums.org for this temporary, but life-saving solution! Press Windows/super key from your keyboard. Then search by typing Ubuntu Software Center, open it. Type dconf-editor in the search bar & install it. 3. Go to desktop —> unity –> devices –> devices-option. The default is “OnlyMounted”. Set to “Never”.